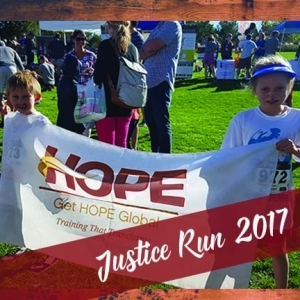 Get HOPE Global will participate for the third time in the Justice Run! This professionally-timed, family-friendly 10K/5K takes place at the beautiful Hudson Gardens in Littleton, CO. 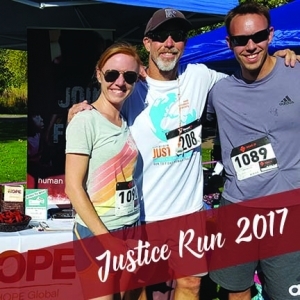 The Justice Run is a family-friendly event that raises money and awareness for human trafficking and its victims. Participants can specify Get HOPE Global as their non-profit beneficiary, and anyone can stop by to visit our booth on race day. Even if you can’t run, you can still donate to the Get HOPE Global team. Run on October 7! Register for the event and select Get HOPE Global as the non-profit who will receive your registration fee. (The sidebar on this page has a registration link). Visit the Get HOPE Global tent on race day, even if you aren’t able to run. We’d love to meet you. Donate toward our race-day goal by using our personalized Justice Run fundraising platform. (Use the handy links in the sidebar of this page). Your gift helps provide business training and microloans to women and girls who are at risk. We are stronger together. Thank you for being a champion of HOPE!